This Classic Vegan French Toast is even better without eggs. Made with chickpea flour and soy milk, this vegan brunch recipe will certainly impress your family and friends. It’s time again to rummage through the posts in the archives and find one that is in desperate need of a make-over. Oh, look! I found it. Classic vegan french toast – a recipe that dates back to 2012! Time to give it a little TLC. I love this vegan french toast recipe. Unfortunately, this cannot be said about all the recipes that were created in my first year of blogging. There were many mistakes as I learned the art and business of food blogging. So many mistakes. But this French Toast recipe wasn’t one of them. It simply had poorly shot pictures that made the toast look unappetizing and then, perhaps, fortunately, got lost in the migration nightmare of 2015. Besides, at the time I was writing a blog that was read by roughly 8 people a month and so this French Toast got buried and lost for years. Typically French toast is made by dipping bread into a custard made of eggs and milk. The custard absorbs into the bread and then is fried in oil or butter for a delicate and delicious breakfast. I mean, a custard-coated, slightly sweetened, maple syrup-doused fried breakfast. Just look at this cinnamon-spiced egg-like custard! Once your French toast is completely coated in your chickpea flour custard, it’s time to cook it! When cooking French Toast you are trying to get both sides of the toast browned while making sure that the center is cooked. This can be difficult so it’s important to be able to get your temperature just right. I have found that setting my electric griddle to 350F has given me the best results. Which is under $40 on Amazon and it’s something I use nearly weekly. 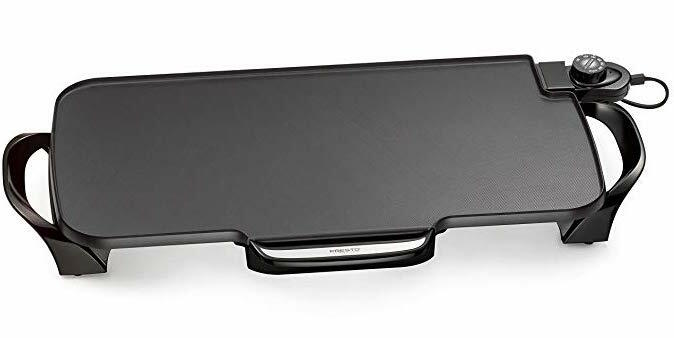 With the electric griddle, I can make all the French toast (or pancakes) at once (rather than in batches) and get the luxury of setting the temperature to exactly what I want. That means not having to worry about the French toast burning. However, if you don’t have an electric griddle, you can do this on a skillet. It may involve trial and error in terms of getting the right temperature. When the French toast is placed on the griddle, it should immediately sizzle. This fries the custard and creates a delicate crust around the French toast. The toast cooks 3 to 4 minutes per side until they are golden brown with dark flecks and soft and chewy in the middle. The French Toast should be served immediately. If it sets too long, it will get cold and soggy. Serve it with fresh berries, coconut whipped cream, and maple syrup. 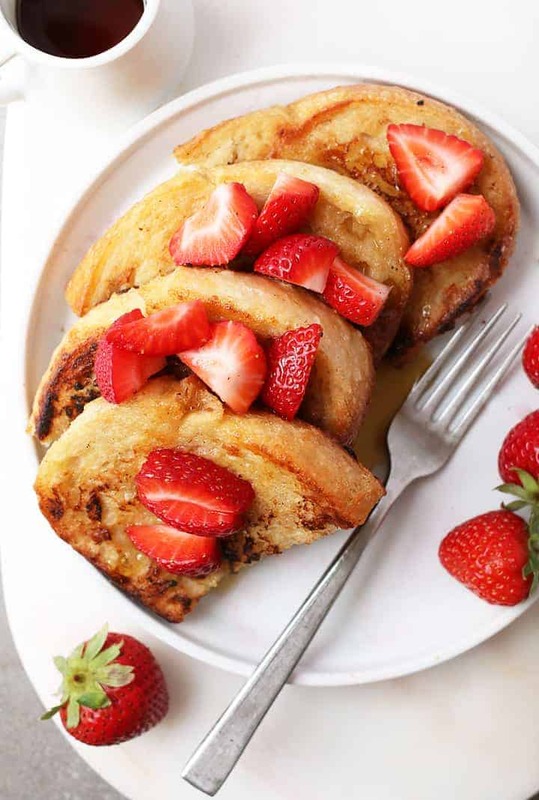 Serve this French Toast as part of your Easter or Mother’s Day brunch along with some vegan scrambled eggs and a Bloody Mary. It’s good for your bread to be a little bit stale. This helps the French Toast hold together when dipped in the custard. You can either buy French bread and let it sit for a day or two or lightly toast your bread before submerging it in the custard. I do recommend chickpea flour for this recipe. However, if you can’t find chickpea flour at your grocery store, you can pick some up online. Otherwise, a flax egg works great for this recipe as well. This recipe works best when cooked on a griddle. 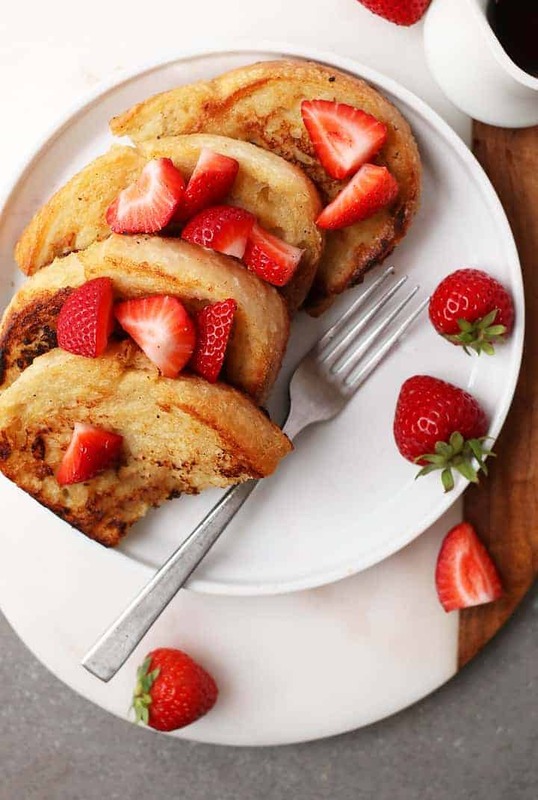 This ensures an even and consistent bake giving the French toast the lightly crispy crust with a soft and chewy middle. Top your French toast with fresh berries, coconut whipped cream, and maple syrup. 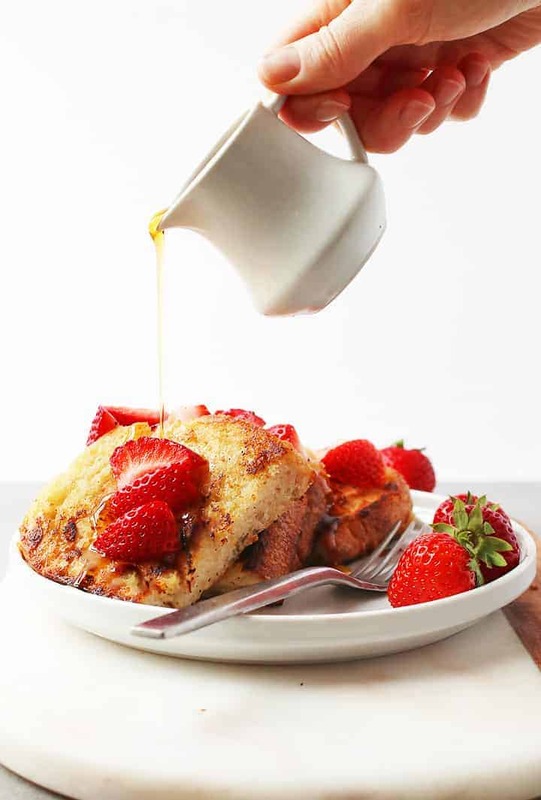 For more flavor, try my Vanilla Spice French Toast. That’s it! 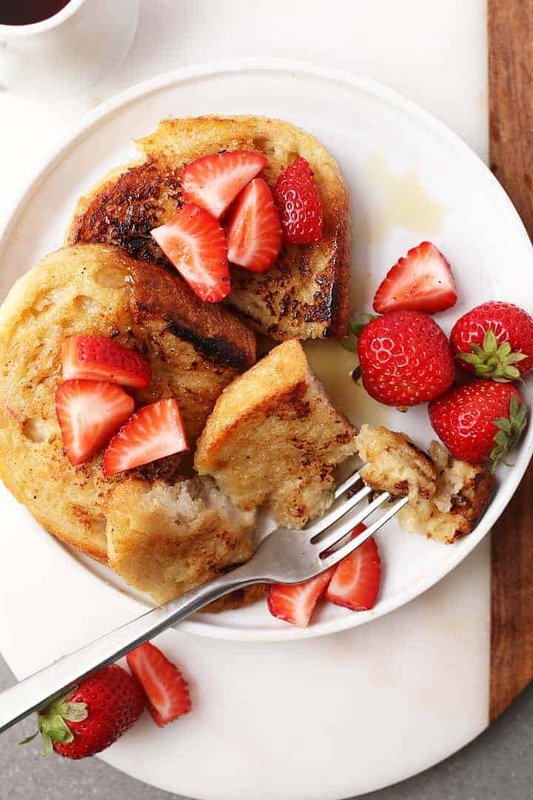 Your step-by-step guide to making the perfect vegan French toast. Now let’s take a look at the recipe below. This Classic Vegan French Toast is made even better without eggs. Made with chickpea flour and soy milk, this vegan brunch recipe will certainly impress. Preheat a griddle to 350 F. Add 1 tablespoon of vegan butter or coconut oil to the griddle and let it melt. In a blender combining chickpea flour, soy milk, vanilla, and cinnamon until the chickpea flour has dissolved completely. 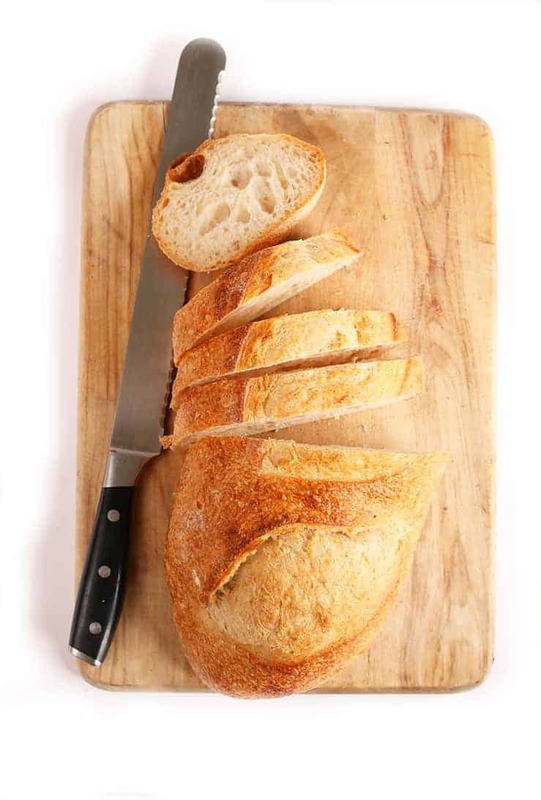 Pour into a shallow dish and place sliced bread in the batter so that one side of the bread is completely submerged. Allow the batter to soak into the bread, 15-20 seconds, flip and soak for another 15 seconds. Once griddle is preheated - it should sizzle with a drop of water - place soaked bread, 2-3 pieces at a time, onto griddle. Cook about 3-4 minutes per side, until golden brown and speckled. Remove from heat and set aside. Top with maple syrup, and fresh fruit and serve immediately. Hi, I tried this and it was delicious but I was wondering what you’d recommend for a savoury version? In England it’s usually a savoury dish and I’m trying to replicate that but I’m not sure how. Thank you! Is there a way I could make this with a flax egg and not chickpea flour? Yes, I believe that would work. If you give it a try, let us know how it goes! I followed your recipe for the challah, and it turned out terrific! I swapped chickpea flour for soy flour since that’s what I have on hand, and I made the swap again for the French toast recipe. Marvelous! I try to do low oil so I didn’t use oil to fry the bread, but I finished it by quickly baking it in the oven for about five minutes at 350. It was a tasty lunch! Awesome! I’m glad it turned out okay. Thanks for sharing the oven technique – I should try that!